Dynamical decoupling, a generalization of the original NMR spin-echo sequence, is becoming increasingly relevant as a tool for reducing decoherence in quantum systems. Such sequences apply non-equidistant refocusing pulses for optimizing the coupling between systems, and environmental fluctuations characterized by a given noise spectrum. One such sequence, dubbed Selective Dynamical Recoupling SDR [P. E. S. Smith, G. Bensky, G. A. Álvarez, G. Kurizki, and L. Frydman, Proc. Natl. Acad. Sci. 109, 5958 (2012)], allows one to coherently reintroduce diffusion decoherence effects driven by fluctuations arising from restricted molecular diffusion [G. A. Álvarez, N. Shemesh, and L. Frydman, Phys. Rev. Lett. 111, 080404 (2013)]. The fully-refocused, constant-time, and constant-number-of-pulses nature of SDR also allows one to filter out “intrinsic” T1 and T2 weightings, as well as pulse errors acting as additional sources of decoherence. This article explores such features when the fluctuations are now driven by unrestricted molecular diffusion. In particular, we show that diffusion-driven SDR can be exploited to investigate the decoherence arising from the frequency fluctuations imposed by internal gradients. As a result, SDR presents a unique way of probing and characterizing these internal magnetic fields, given an a priori known free diffusion coefficient. This has important implications in studies of structured systems, including porous media and live tissues, where the internal gradients may serve as fingerprints for the systems composition or structure. The principles of this method, along with full analytical solutions for the unrestricted diffusion-driven modulation of the SDR signal, are presented. The potential of this approach is demonstrated with the generation of a novel source of MRI contrast, based on the background gradients active in an ex vivo mouse brain. Additional features and limitations of this new method are discussed. via Diffusion-assisted selective dynamical recoupling: A new approach to measure background gradients in magnetic resonance, J. Chem. Phys. 140, 084205 (2014); http://dx.doi.org/10.1063/1.4865335. 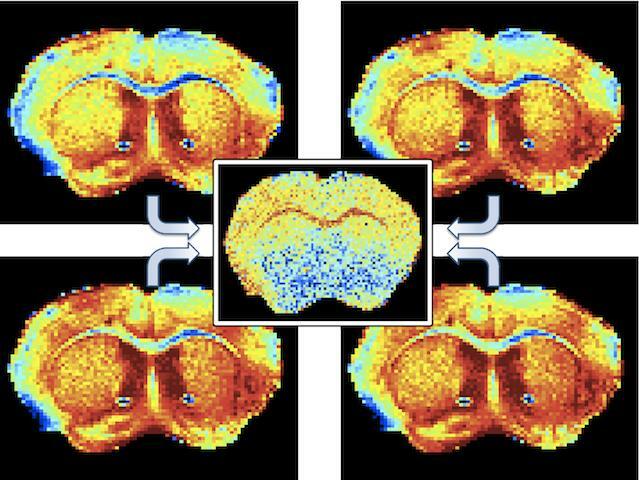 Selective dynamical recoupling (SDR) series of images and the corresponding ex-vivo mouse brain background gradients (central panel) derived from these data. This entry was posted in Publications and tagged Background gradients, decoherence, diffusion processes, dynamical decoupling, dynamical decoupling noise spectroscopy, magnetic resonance, magnetic resonance spectroscopy, magnetic suceptibility, NMR, NOGSE, noise spectroscopy, nuclear magnetic resonance, nuclear magnetic resonance spectroscopy, OGSE, quantum control, quantum physics, quantum science, quantum state, research, science, SDR, selective dynamical decoupling, spectroscopy nmr, spin dynamics, spin-echo, weizmann institute of science. Acting Locally, Reporting Globally: From quantum physics to biology, a new approach to magnetic resonance turns protons into “spies”.